Hiring? Toptal handpicks top Linux developers to suit your needs. Mahmud is a software developer with many years of experience and a knack for efficiency, scalability, and stable solutions. With the advent of tools like Docker, Linux Containers, and others, it has become super easy to isolate Linux processes into their own little system environments. This makes it possible to run a whole range of applications on a single real Linux machine and ensure no two of them can interfere with each other, without having to resort to using virtual machines. These tools have been a huge boon to PaaS providers. But what exactly happens under the hood? These tools rely on a number of features and components of the Linux kernel. Some of these features were introduced fairly recently, while others still require you to patch the kernel itself. But one of the key components, using Linux namespaces, has been a feature of Linux since version 2.6.24 was released in 2008. Anyone familiar with chroot already has a basic idea of what Linux namespaces can do and how to use namespace generally. Just as chroot allows processes to see any arbitrary directory as the root of the system (independent of the rest of the processes), Linux namespaces allow other aspects of the operating system to be independently modified as well. This includes the process tree, networking interfaces, mount points, inter-process communication resources and more. Why Use Namespaces for Process Isolation? In a single-user computer, a single system environment may be fine. But on a server, where you want to run multiple services, it is essential to security and stability that the services are as isolated from each other as possible. Imagine a server running multiple services, one of which gets compromised by an intruder. In such a case, the intruder may be able to exploit that service and work his way to the other services, and may even be able compromise the entire server. Namespace isolation can provide a secure environment to eliminate this risk. For example, using namespacing, it is possible to safely execute arbitrary or unknown programs on your server. Recently, there has been a growing number of programming contest and “hackathon” platforms, such as HackerRank, TopCoder, Codeforces, and many more. A lot of them utilize automated pipelines to run and validate programs that are submitted by the contestants. It is often impossible to know in advance the true nature of contestants’ programs, and some may even contain malicious elements. By running these programs namespaced in complete isolation from the rest of the system, the software can be tested and validated without putting the rest of the machine at risk. Similarly, online continuous integration services, such as Drone.io, automatically fetch your code repository and execute the test scripts on their own servers. Again, namespace isolation is what makes it possible to provide these services safely. Namespacing tools like Docker also allow better control over processes’ use of system resources, making such tools extremely popular for use by PaaS providers. Services like Heroku and Google App Engine use such tools to isolate and run multiple web server applications on the same real hardware. These tools allow them to run each application (which may have been deployed by any of a number of different users) without worrying about one of them using too many system resources, or interfering and/or conflicting with other deployed services on the same machine. With such process isolation, it is even possible to have entirely different stacks of dependency softwares (and versions) for each isolated environment! If you’ve used tools like Docker, you already know that these tools are capable of isolating processes in small “containers”. Running processes in Docker containers is like running them in virtual machines, only these containers are significantly lighter than virtual machines. A virtual machine typically emulates a hardware layer on top of your operating system, and then runs another operating system on top of that. This allows you to run processes inside a virtual machine, in complete isolation from your real operating system. But virtual machines are heavy! Docker containers, on the other hand, use some key features of your real operating system, including namespaces, and ensure a similar level of isolation, but without emulating the hardware and running yet another operating system on the same machine. This makes them very lightweight. Historically, the Linux kernel has maintained a single process tree. The tree contains a reference to every process currently running in a parent-child hierarchy. A process, given it has sufficient privileges and satisfies certain conditions, can inspect another process by attaching a tracer to it or may even be able to kill it. With the introduction of Linux namespaces, it became possible to have multiple “nested” process trees. Each process tree can have an entirely isolated set of processes. This can ensure that processes belonging to one process tree cannot inspect or kill - in fact cannot even know of the existence of - processes in other sibling or parent process trees. Every time a computer with Linux boots up, it starts with just one process, with process identifier (PID) 1. This process is the root of the process tree, and it initiates the rest of the system by performing the appropriate maintenance work and starting the correct daemons/services. All the other processes start below this process in the tree. The PID namespace allows one to spin off a new tree, with its own PID 1 process. The process that does this remains in the parent namespace, in the original tree, but makes the child the root of its own process tree. With PID namespace isolation, processes in the child namespace have no way of knowing of the parent process’s existence. However, processes in the parent namespace have a complete view of processes in the child namespace, as if they were any other process in the parent namespace. 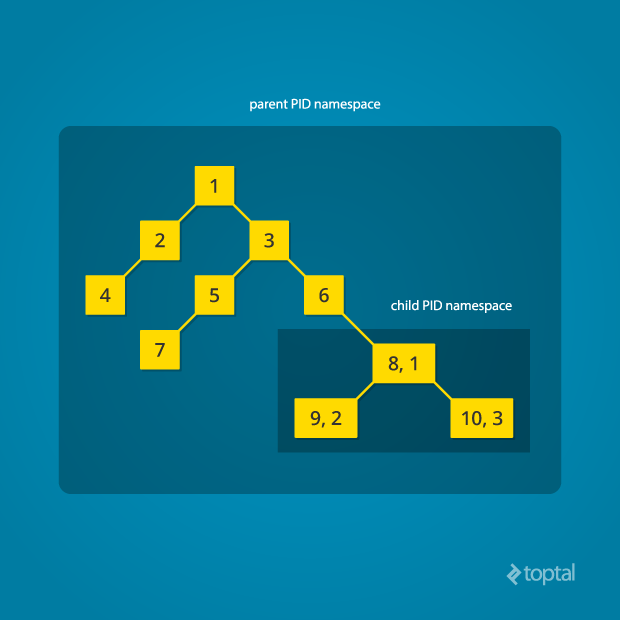 It is possible to create a nested set of child namespaces: one process starts a child process in a new PID namespace, and that child process spawns yet another process in a new PID namespace, and so on. The PID, as printed from within the child_fn, will be 1. Even though this namespace tutorial code above is not much longer than “Hello, world” in some languages, a lot has happened behind the scenes. The clone() function, as you would expect, has created a new process by cloning the current one and started execution at the beginning of the child_fn() function. However, while doing so, it detached the new process from the original process tree and created a separate process tree for the new process. However, this is just the first step in our tutorial. These processes still have unrestricted access to other common or shared resources. For example, the networking interface: if the child process created above were to listen on port 80, it would prevent every other process on the system from being able to listen on it. This is where a network namespace becomes useful. A network namespace allows each of these processes to see an entirely different set of networking interfaces. Even the loopback interface is different for each network namespace. What’s going on here? The physical ethernet device enp4s0 belongs to the global network namespace, as indicated by the “ip” tool run from this namespace. However, the physical interface is not available in the new network namespace. Moreover, the loopback device is active in the original network namespace, but is “down” in the child network namespace. 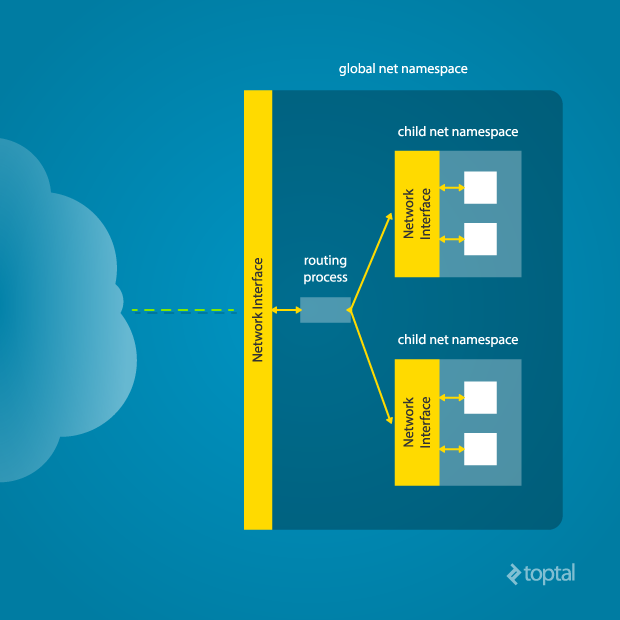 In order to provide a usable network interface in the child namespace, it is necessary to set up additional “virtual” network interfaces which span multiple namespaces. Once that is done, it is then possible to create Ethernet bridges, and even route packets between the namespaces. Finally, to make the whole thing work, a “routing process” must be running in the global network namespace to receive traffic from the physical interface, and route it through the appropriate virtual interfaces to to the correct child network namespaces. Maybe you can see why tools like Docker, which do all this heavy lifting for you, are so popular! Here, <pid> should be replaced by the process ID of the process in the child namespace as observed by the parent. Running this command establishes a pipe-like connection between these two namespaces. The parent namespace retains the veth0 device, and passes the veth1 device to the child namespace. Anything that enters one of the ends, comes out through the other end, just as you would expect from a real Ethernet connection between two real nodes. Accordingly, both sides of this virtual Ethernet connection must be assigned IP addresses. Linux also maintains a data structure for all the mountpoints of the system. It includes information like what disk partitions are mounted, where they are mounted, whether they are readonly, et cetera. With Linux namespaces, one can have this data structure cloned, so that processes under different namespaces can change the mountpoints without affecting each other. Creating separate mount namespace has an effect similar to doing a chroot(). chroot() is good, but it does not provide complete isolation, and its effects are restricted to the root mountpoint only. Creating a separate mount namespace allows each of these isolated processes to have a completely different view of the entire system’s mountpoint structure from the original one. This allows you to have a different root for each isolated process, as well as other mountpoints that are specific to those processes. Used with care per this tutorial, you can avoid exposing any information about the underlying system. Initially, the child process sees the exact same mountpoints as its parent process would. 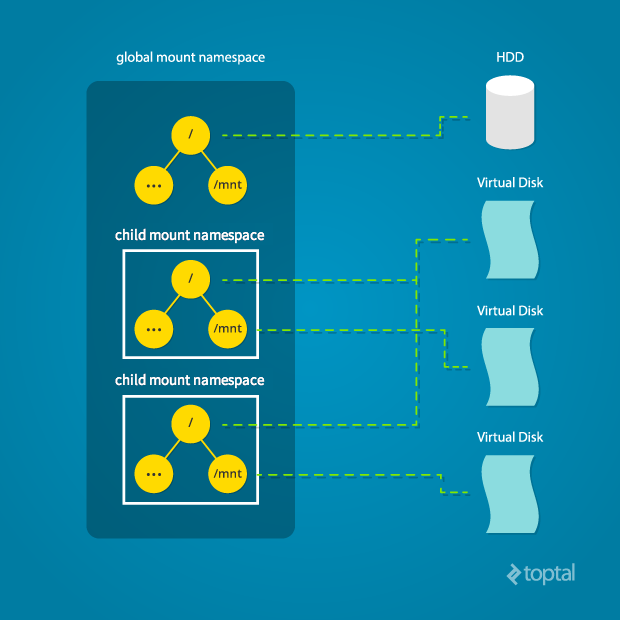 However, being under a new mount namespace, the child process can mount or unmount whatever endpoints it wants to, and the change will affect neither its parent’s namespace, nor any other mount namespace in the entire system. For example, if the parent process has a particular disk partition mounted at root, the isolated process will see the exact same disk partition mounted at the root in the beginning. But the benefit of isolating the mount namespace is apparent when the isolated process tries to change the root partition to something else, as the change will only affect the isolated mount namespace. Interestingly, this actually makes it a bad idea to spawn the target child process directly with the CLONE_NEWNS flag. A better approach is to start a special “init” process with the CLONE_NEWNS flag, have that “init” process change the “/”, “/proc”, “/dev” or other mountpoints as desired, and then start the target process. This is discussed in a little more detail near the end of this namespace tutorial. Here, child_fn() prints the nodename, changes it to something else, and prints it again. Naturally, the change happens only inside the new UTS namespace. Often it is necessary to establish some sort of communication between the parent and the child namespace. This might be for doing configuration work within an isolated environment, or it can simply be to retain the ability to peek into the condition of that environment from outside. One way of doing that is to keep an SSH daemon running within that environment. You can have a separate SSH daemon inside each network namespace. However, having multiple SSH daemons running uses a lot of valuable resources like memory. This is where having a special “init” process proves to be a good idea again. And since the “init” process is something you have devised, you can make it do all the necessary work first, and then isolate itself from the rest of the system before executing the target child. This tutorial is just an overview of how to use namespaces in Linux. It should give you a basic idea of how a Linux developer might start to implement system isolation, an integral part of the architecture of tools like Docker or Linux Containers. In most cases, it would be best to simply use one of these existing tools, which are already well-known and tested. But in some cases, it might make sense to have your very own, customized process isolation mechanism, and in that case, this namespace tutorial will help you out tremendously. There is a lot more going on under the hood than I’ve covered in this article, and there are more ways you might want to limit your target processes for added safety and isolation. But, hopefully, this can serve as a useful starting point for someone who is interested in knowing more about how namespace isolation with Linux really works. Mahmud is a software developer with a knack for efficiency, scalability, and stable solutions. With years of experience working with a wide range of technologies, he is still interested in exploring, encountering, and solving new and interesting programming problems. First of all thanks for writing such a good article.This is the only article which i found on internet to be usefull apart from man pages of clone. If possible could you please write an article on how the namespaces are implemented in /proc fs. I am glad you liked it! We will think about going more in-depth in future articles on this topic..
Great article written by a young man like you. I came across this article while searching for Namespace concept in Linux. You have explained in very simple way with great clarity as well as detailed enough. Thank you for writing this article. Thank you. I am glad you liked it. Hello Mahmud, the article is amazing, thanks for sharing it! Nice article, straight to the concept. Thank you for the great work. Nice article and clear even for a beginner like me. Namespaces should be increasingly taught in college courses like Network Programming, Cloud Computing. This is a comprehensive article. Thanks! I too sometimes wish that college courses were better designed. Between the network namespaces communication needs to go via Layer 3 or can be just a layer 2 communication? Thanks, Cleared many of my doubts. Thank you very much for this article!! Great explanation and pics. Awesome article, Thank you so much. Good article. It saves me a lot of time to read the man page. Thanks! May i ask about this 'static char child_stack;'. Is there a reason its that number? the clone() call returns -1 for me. Any way to debug it? should have seen that! :) I really appreciate your tutorial! I want to build a mini docker implementation, but I'm not sure what would be the best way to kind of jail the filesystem like docker does, I read that they doesn't use chroot. Do you know anywhere I can find a good resource on how I would do this? I tried the stuff you explained but if I start a bash session in the new namespace and create a folder with mkdir then exit to the main process again, I can see the folder there to. Thanks for putting in so much effort and explaining the concepts so clearly Mahmud. This really gives a good point for anyone looking to understand docker internals. Wow, such a great article. Now I think I've truly understood what's a container. Very useful article to understand how Linux Container can be used instead of VM for deploying multiple environments for different applications without interfering others environment.It helps me to get a clear picture on role of namespaces(one important basic componenet of Linux Container) in Linux Container. Thanks for taking the time to write this article. This is a great coverage of what Linux namespaces are. It's clear, concise, and the provided examples are on point. Kudos! Very Insightful. Really appreciate the balance between theoretical & implementation aspect of linux namespaces. Thanks a lot, would help me to understand Docker better. Great Article. Thanks Ridwan for your time.